Buchholz Gallery (Curt Valentin), New York. Julia M. Hagerty, Chicago (by 1966). V. and M. Langen, Kunst des 20ten Jahrhunderts: Sammlung Viktor u. Marianne Langen, Ascona, 1986, vol. I, p. 57 (illustrated in color, p. 58). G. Bauquier, Fernand Léger: Catalogue raisonné de l'oeuvre peint, 1925-1928, Paris, 1993, vol. III, p. 186, no. 498 (illustrated). Chicago, International Galleries, Modern Masters: An Exceptional Selection of Paintings Representing Various Aspects of the Post-Impressionist, Cubist, Expressionist, Surrealist and New French Schools, September-October 1961, p. 24, no. 27 (illustrated). Chicago, International Galleries, Fernand Léger: Restrospective Exhibition, November-December 1966, p. 58, no. 21 (illustrated, p. 26). Lugano, Museo d'Arte Moderna, Passioni d'arte da Picasso a Warhol: Capolavori del collezionismo in Ticino, September-December 2002, p. 194 (illustrated in color, p. 195; titled Nature Morte). 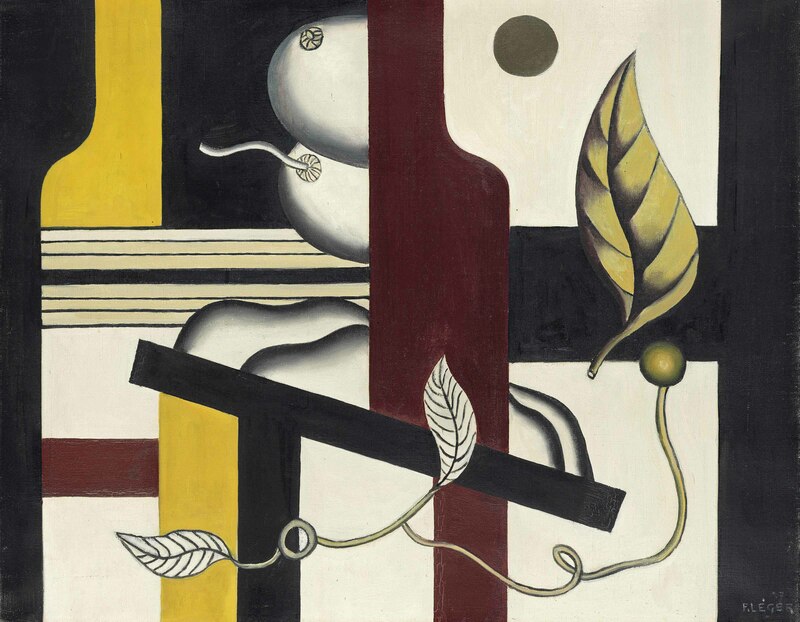 The appearance of a solitary, commonplace, but larger-than-life leaf, as seen in Les Fruits, signifies the crucial transformation that occurred in Léger's art during the late 1920s. Until then, an unshakable commitment to a machine aesthetic had dominated his painting; Léger had developed and promulgated this pictorial program as the only approach to contemporary painting he believed to be genuinely modernist, indeed insisting it constituted an irrefutable historical imperative to which artists must give attention. His preference for mechanical elements led to his creation of the sleekly metallic nudes in Le Grand Déjeuner, 1921, the utilitarian architecture of urban, portside and industrial landscapes during 1923-1924, and since 1925 the monumentalized objects, mostly of industrial manufacture, he had placed within rigidly architectural settings, proclaiming the high Purist classicism of his most recent still-life paintings (fig. 1). Enter then, however, that interloping leaf, first in 1926, and then frequently thereafter during 1927 (Bauquier, no. 494; fig. 2). It proved to be a harbinger of things to come. Here, in Les Fruits, an even more irregular organic form in the shape of a twisting vine further heightens the visual contrast with the geometry of the picture plane, as well the as partly blocked-out rotund and polished shapes of fruit. During the late 1920s Léger was in fact undertaking a significant transition in his art, "a decisive change," as Jean Leymarie observed, "the abrupt turning from a static, frontal, solemn order to a fluid and playful freedom" (J. Cassou and J. Leymarie, Fernand Léger: Drawings and Gouaches, Greenwich, 1973, p. 99). This metamorphosis would utterly transform his art by the end of the decade. Like a snake shedding its skin, Léger set aside the mighty forms of classicism in his still-lifes to incorporate those organic, more inclusively selected and spatially liberated forms of what he called the "new realism," founded upon his concept of "the object in space." "In painting the strongest restraint had been that of subject matter upon composition, imposed by the Italian Renaissance. This effort toward freedom began with the Impressionists and has continued to express itself until our day... The moderns are going to develop it, isolate it, and extract every possible result from it" (Léger, "The New Realism," 1935, in E.F. Fry, ed., Fernand Léger: Functions of Painting, New York, 1973, p. 109). "The subject in painting has already been destroyed, just as avant-garde film destroyed the story line. I thought that the object, which had been neglected, was the thing to replace the subject" (Léger, in J. Cassou and J. Leymarie, op. cit., p. 87). Léger's grandly classical still-life paintings of the mid-1920s had already exalted the individual object--in and of itself, as well as in relation to other objects in the composition--on a truly monumental scale, set within the larger context of the culminating stage of his engagement with classicism, in which he strongly emphasized the values of structural balance and order in his pictures (fig. 1). These paintings reflect Léger's most fully considered and definitive response to le rappel à l'ordre--"the call to order"--a classicizing trend that had strongly influenced the arts since the end of the First World War. Towards the end of the 1920s, however, Léger felt that the discipline of classicism had become more of a stricture than a strength, and that the imposition of order--insofar as he had made it a virtue for its own sake--had begun to encumber him in his efforts to maximize the expression in his paintings of contrasts in both object and form, which had always been and should remain, he believed, the primary impetus in his art. He began during 1927-1928 to divest his work of the classical structure that underpinned the still-life compositions he had painted in recent years, and discard those rigid, geometric frames--the formal grid--which had enforced "the call to order" in his paintings. He simultaneously cut loose the object from its accustomed pictorial moorings and allowed it to float freely across the canvas, as the leaf and vine do here, lending his compositions an aspect of randomness and spontaneity that was entirely new in his work. "I placed objects in space so that I could take them as a certainty. I felt that I could not place an object on a table without diminishing its value... I selected an object, chucked the table away. I put the object in space, minus perspective. Minus anything to hold it there. I then had to liberate color to an even greater extent" (Léger, in P. de Francia, Fernand Léger, New Haven, 1983, p. 111). The individual leaves and flowers that began to appear, occasionally with the "rhyming" form of seashells, among Léger's man-made objects with increasing prominence and frequency during 1927 (Bauquier, nos. 484 and 490; figs. 3 and 4, respectively), have a most casual origin. Often spending his summers on the family farm in Normandy which he inherited on the death of his mother, Léger drew and painted objects he found there "as a Naturalist would have," Leymarie has pointed out, "without realizing that he was following, after three centuries, another Norman, Nicolas Poussin, who used to bring back from his walks around Rome a stock of pebbles and leaves to make his rocks and trees" (op. cit., Greenwich, 1973, p. 116). "I adore trees," Léger declared. "I can't rest when there are trees around me. I'm enormously tempted to paint them, but I know that I shall never be able to paint them as I see them. How could I ever give them more expressiveness then they have? I know I am beaten before I start" (quoted in ibid., p. 115). "Magnifying an object, or a small part of an object, gives it an identity which it has never had before, and so it becomes the vehicle for an entirely new kind of lyrical power" (Léger, in ibid.). Indeed, the present Les Fruits--for which Léger painted a smaller preliminary version (Bauquier, no. 499; Museum des Jahrhunderts, Vienna), as well as two variants in a vertical format (nos. 495 and 496; the latter, Fondation Beyeler, Basel)--and other works in the "leaf" series are clear demonstrations of the process by which the artist has isolated, magnified and in effect showcased the object, having removed it from its customary context--in this case, the conventional landscape of trees (the subject). Fernand Léger in his Paris studio, circa 1930. Photograph by Roger-Viollet, Paris. (fig. 1) Fernand Léger, Nature morte, 1927. Formerly in the collection of James Johnson Sweeney. Sold, Christie's, New York, 3 November 2010, lot 17. (fig. 2) Fernand Léger, Nature morte (Composition à la feuille), 1927. Musée national Fernand Léger, Biot. (fig. 3) Fernand Léger, Nature morte, 1927. Kunstmuseum Winterthur. (fig, 4) Fernand Léger, Feuilles et coquillage, 1927. Tate Modern, London.